Valentine’s Day is just around the corner and before you know it, your house will be filled with red and pink decorations! But why stop decorating there? This year it’s time to get your little ones in on the fun and deck out their space too. Transforming their favorite playhouse is the perfect way to spread the love. The best part of the DIY is that you can personalize it to fit your specific needs. You can choose to make your decorations or even buy them premade. In the end, it’s up to you on how your playhouse looks, so get creative and add your personal touches. Whichever way you decide to go, you cannot go wrong! Cover your playhouse in string lights to make it look spectacular at any time of the day. There’s a variety of different heart shaped string lights available, so you’ll be sure to find something that suits your playhouse. Most lights are battery operated so it eliminates the hassle of plugging things in. We must admit that we are a big fan of the ribbon tassel trend that has been taking over lately. It’s a simple DIY project that can keep you and your little ones busy during the colder months, plus it’s super cute and can be reused post-Valentine’s Day! No Valentine’s Day playhouse would be complete without a mailbox to receive all your love notes! The best part is you can customize yours to reflect your favorite interests. Into superheroes? Then make a superhero mailbox. The possibilities are endless! Nothing says welcome like some cute door decorations! We combined a simple construction paper chain and a heart covered wreath to welcome visitors when they enter. Now that you’ve seen our Valentine’s inspired playhouse, we want to see yours! Post a photo of your decorated playhouse on social media and make sure to use the tag #Step2VDayGiveaway (or upload your photo here). One winner will be selected and announced publicly on 2/14/19 via Step2 Social Media pages and contacted via DM. 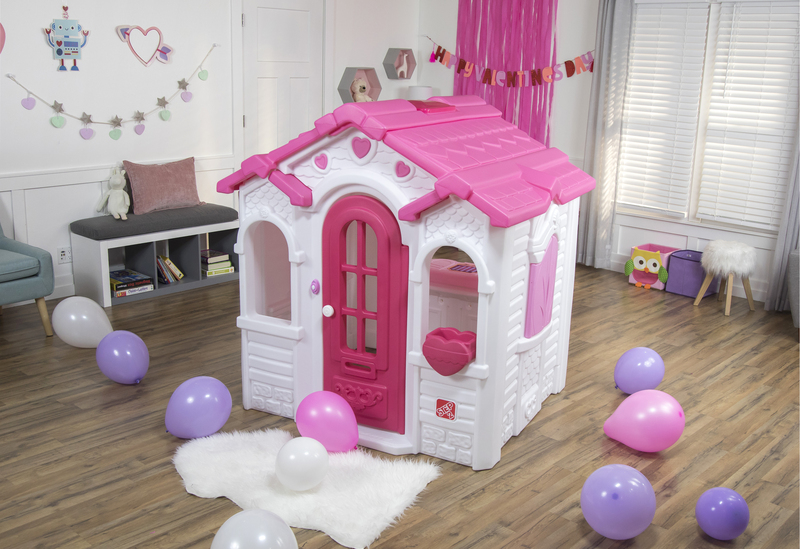 Winner will receive a Step2 Sweetheart Playhouse. Entries are open to residents of the 48 Contiguous United States and District of Columbia on 2/5/19 12:01 AM ET through 2/11/2019 11:59 PM ET. This contest is facilitated by The Step2 Company, LLC. is not responsible for technical errors, the contest is not sponsored, endorsed or administered by, or associated with, Facebook, Twitter or Instagram. My daughter doesn’t currently have a playhouse only a play kitchen, will that count? Step2 Any Step2 product that is decorated for Valentine’s Day is eligible to enter. Our goal is to see kids get creative and have fun with their family and friends! Any Step2 product that is decorated for Valentine’s Day is eligible to enter. Our goal is to see kids get creative and have fun with their family and friends!